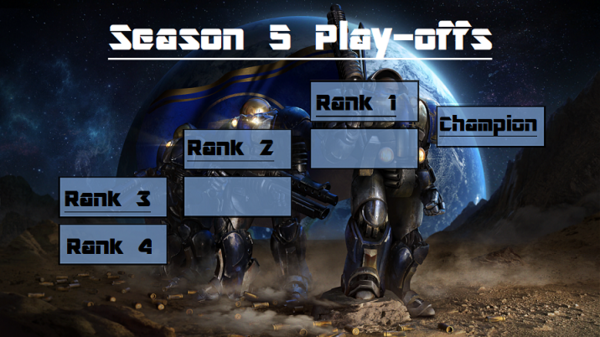 Based on feedback, we at www.Starcraftworld.net have decided to introduce a "Top 4 play-offs" format to determine the true winner of the SCW season 5 1vs1 ladder! No more dodging to avoid losing points and no more bashing of lower ranks to win. Instead the top four players will, at the end of the season, be seeded according to their ranks on the 1vs1 ladder and fight to be called the champion! Now you might wonder if this seems unfair to ranks 1 and 2, but we have found a solution for that. In order to ensure that rank 1 remains more important than rank 2, and rank 2 more important than rank 3 and so forth, we have decided for the following format. Rank 4 plays Rank 3 in a "best of 5" series in the first round of the play-offs. The winner proceeds to the second round and will play a "best of 5" series against rank 2. The winner of this series will then proceed to play against Rank 1 in a "best of 7" series to determine the definitive champion of the season. An example of the bracket can be found at the bottom of the post. All matches will be Random vs Random and can be played on either the standard SCW 5 map or the 2.0 map. A couple days before the end of the season I will open a thread with the relevant details, rules and instructions that the participants will have to follow. Until then, stay tuned and play your hearts out to earn your spot in the play-offs! Re: SEASON 5 1vs1 PLAY-OFFS ANNOUNCEMENT! Cool. Defjam wins every season he participates in forever. Bet. for this nice Season i give WINNER of 1S +50 Doller. i will talk to sword. Great idea, but will lose active . Brain will play again tho. LOL ur not even in top 5. This was 100% in response to last season. its better bo7 previous rounds and the final BO9. I an ideal world it is, however getting people from different time-zones to play multiple Bo7 is really tough because of time constraints. I support this idea, that way you can't just grind/dodge your way to 1st place end of season. hi season5 what is the prize money? Brain, you dont try out for asl 5? 1vs1 is 140 dollar and 2vs2 is 80 dollar. There are some people who said they will add more money but we don't know for sure yet. Also, congratulations for winning shin.style tournament!